Scaled floating wind turbines could be tested in both the coastal basin and the ocean basin of the COAST Laboratory with the addition of a wind generator. 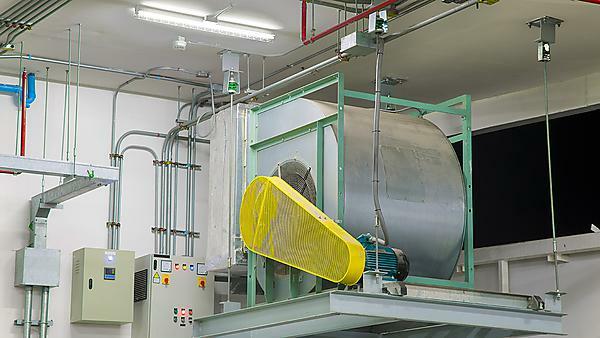 The wind generator of the École Centrale de Nantes gave inspiration to the open-jet blower type wind generator to be implemented in the COAST Laboratory. As a first step, a small wind generator was designed, set-up and tested. It uses two backward bladed centrifugal fans of 1.8 kW each. The airflow produced by the fans is guided through flexible ducts and a reducing Y piece into a single flexible duct, as can be seen on the photo. At the outlet, one honeycomb and one screen control turbulence levels. First experiments using a 3D ultrasonic anemometer allowed the determination of average wind speed and turbulence levels on the central axis of the flow as well as in planes perpendicular to the main flow direction. So far, only measurements at constant wind speed have been carried out. The wind speed was measured at various distances from the outlet for various combinations of honeycomb and screen. This first small wind generator produces quality wind over an area measuring 40 cm by 40 cm with wind speeds up to 14 m/s. A bigger wind generator is expected to produce quality wind over an area measuring 1.4 m by 1.4 m with wind speeds up to 6.5 m/s, using more powerful fans. These bigger fans will produce wind at the end of the ocean basin and this wind will be guided through a duct to the test location in the ocean basin. One challenge will be the suspension of this duct over the basin, though through this system, the weight to be suspended is reduced significantly when comparing it to placing fans above the basin. Next steps include comparison of experimental results with CFD simulation of airflow in the laboratory, design and set-up of a wind generator using more powerful fans, search for interesting models of floating wind turbines to be tested and determination of methods to overcome the incompatibility of Froude and Reynolds scaling.